Tektites in the Australasian strewn field. This bibliography aims to give an overview of English, French and German language literature available on the subject ‘Tektites in the Australasian strewn field’. The bibliography is usable for tektite specialists like geologists, geophysicists and enthusiasts like collectors and dealers. No concern has been given to the readability or understandability of the referenced literature. The search was done by starting with the keyword ‘Tektite’ only. And then narrow the search by connecting it to the keyword expression ‘Australasian strewn field’. The references have been searched in 97 databases of which 8 gave usable hits and one library (See appendix 1.) No secondary references have been included. The references are classified into 6 major subjects, General topics, Creation theories, Formation theories, Chemical composition, Trace elements and Age, decided mainly from the title or the abstract when needed. General topics: Gives a brief overview of general conditions and discussions about the Australasian Strewn field. Creation theories: Papers that mainly discuss the different creation theories for tektites. Formation theories: Papers that discuss how the four different Australasian tektite types are formed, Splashforms, Moung Nong, Australites and Microtektites. Chemical composition: Papers that discuss the major chemical elements of tektites, composition and variations. Trace elements: Papers that discuss low concentration chemical elements like Beryllium, Uranium etc. Age: Papers that mainly discuss the age of the Australasian strewn field using different dating techniques. The references are listed according to the Numeric System. Where the references from the source differs from the template of the numeric system, the source standard is preserved. For example the names ‘B. P. Glass. and Virgil E. Barnes’ are preserved but should have been changed to: ‘GLASS, B. P. and BARNES, V. E.’ if the numeric template was followed strictly. Similarly ‘Page(s)’ is not changed to ‘pp.’ etc. and the title alone is always in Italic, irrespective of the document type. To follow the numeric template strictly would make it difficult or impossible exactly to trace the reference in the electronic source. For ‘Tektites in the Australasian strewn field’. For sources see Appendix 1. LACROIX, M.A. LITHOLOGIE. – Nouvelles observations sur la distribution des tektites de l,Indochine. EXTRAIT des Comptes Rendus l’Academie des Sciences, Tome 191, p.893 séance du 17 Novembre 1930. LACROIX, M.A. Les TECHTITES DE L’INDOCHINE. Extrait des “Archives National D’historire Naturelle’, 1932, 6 Serie, Tome VIII. LACROIX, M.A. LITHOLOGIE. – Nouvelles observations sur la distribution des tektites en Indochine et dans les pays voisins. EXTRAIT des Comptes Rendus l’Academie des Sciences, No I du 2 Juillet 1934 – Tome 199, page 6. LACROIX, M.A Les Tectites de l’ Indochine et de ses abords et celles de la Cote d’Ivoire. EXTRAIT des Archives Du Museum D’historie Naturelle, Paris, 1935, 6 Serie –Jubilaire. SCHNETZLER, C.C. and McHONE, J.F. Source of Australasian tektites: Investigating possible impact sites in Laos. Meteoritics & Planetary Science 31, pp. 73-76 (1996). Meteoritical Society, 1996. William A. Cassidy. Experimental testing of hypotheses for the origin of tektites. Geochimica et Cosmochimica Acta, Volume 28, Issue 6, June 1964, Pages 999-1000. FONTAINE, H. TECTITES DU VIET-NAM MERIDIONAL: REPARTITION GEOGRAPHIQUE, RICHESSE DES GISEMENTS. C.R. somm. Soc. Geol. Fr.,1976.facs 2. p.37-39. B. P. Glass. No evidence for a 0.8-0.9 m.y. old micro-australite layer in deep-sea cores. Earth and Planetary Science Letters, Volume 77, Issues 3-4, April 1986, Pages 428-433. M. Shyam Prasad. Australasian microtektites in a substrate: A new constraint on ferromanganese crust accumulation rates. Marine Geology, Volume 116, Issues 3-4, February 1994, Pages 259-266. Schneider, David. Blast from the past. Scientific American; Aug95, Vol. 273 Issue 2, p16, 3/5p, 1c. McColi, D. H. A flanged toroidal tektite from Australia. METEORITICS AND PLANETARY SCIENCE, Year: 1997, VOL 32; NUMBER 6, Page(s) 981-982. Warnes, P. N.; Orchiston, W.; Englert, P. A. A reported tektite transported from Australasia and found at Gabriel's Gully mining camp, Central Otago, New Zealand. JOURNAL- ROYAL SOCIETY OF NEW ZEALAND,Year: 1998, VOL 28; NUMBER 2, Page(s) 329-331. Paul D. Lowman, Jr. The relation of tektites to lunar igneous activity. Icarus, Volume 2, 1963, Pages 35-48. Dean R. Chapman, Howard K. Larson and Leroy C. scheiber. Population polygons of tektite specific gravity for various localities in Australasia. Geochimica et Cosmochimica Acta, Volume 28, Issue 6, June 1964, Pages 821-836. Dean R. Chapman. On the unity and origin of the Australasian tektites. Geochimica et Cosmochimica Acta, Volume 28, Issue 6, June 1964, Pages 841-850. R. L. Fleischer and P. B. Price. Fission track evidence for the simultaneous origin of tektites and other natural glasses. Geochimica et Cosmochimica Acta, Volume 28, Issue 6, June 1964, Pages 755-756. R. L. Fleischer, P. B. Price and R. M. Walker. On the simultaneous origin of tektites and other natural glasses. Geochimica et Cosmochimica Acta, Volume 29, Issue 3, March 1965, Pages 161-162. J. J. Gilvarry, The lunar origin of tektites. Icarus, Volume 4, Issue 3, July 1965, Pages 317-318. Erwin David. Meteorite impacts and the ejection mechanism of tektites. Earth and Planetary Science Letters, Volume 1, Issue 2, March 1966, Pages 75-76. S. R. Taylor. Criteria for the source of Australites. Chemical Geology, Volume 4, Issues 3-4, June 1969, Pages 451-459. Billy P. Glass. Reworking of deep-sea sediments as indicated by the vertical dispersion of the Australasian and ivory coast microtektite horizons. Earth and Planetary Science Letters, Volume 6, Issue 6, 1969, Pages 409-415. John T. Wasson. Layered tektites: a multiple impact origin for the Australasian tektites. Earth and Planetary Science Letters, Volume 102, Issue 2, February 1991, Pages 95-109. Shyam Prasad, M.; Mislankar, P. G.; Nirmal Charan, S.; Prasad, K. A tektite fragment discovered in the Central Indian Basin. CURRENT SCIENCE -BANGALORE-, Year: 1998, VOL 74; NUMBER 5, Page(s) 405-407. Koeberl, C, Glass, BP, Chaussidon, M. Bottle-green microtektites from the Australasian tektite strewn field: Did they form by jetting from the top layer of the target surface?. Geochemistry, Univ. Vienna, Althanstrasse 14, A-1090 Vienna, Austria. Conference paper: 1999 Annual Meeting of the Geological Society of America, Denver, CO (USA), 25-28 Oct 1999. (World Meeting Number 199 945037). Prasad M.S. ; Khedekar V.D. Impact microcrater morphology on Australasian microtektites. Meteoritics & Planetary Science, 1 September 2003, vol. 38, no. 9, pp. 1351-1371(21). Prasad M.S. ; Gupta S.M. ; Kodagali V.N. Two layers of Australasian impact ejecta in the Indian Ocean?. Meteoritics & Planetary Science, 1 September 2003, vol. 38, no. 9, pp. 1373-1381(9). Zhu, Z.-y. ; Zhou, H.-y. ; Qiao, Y.-l. Initial Sqtrata Occurrence of the South ChinaTektite in Strata and Its Lmplication for Evrent-Straigraphy. JOURNAL OF GEOMECHANICS, VOL 7; PART 4,Page(s) 302-307. S. R. Taylor. Consequences for tektite composition of an origin by meteoritic splash. Geochimica et Cosmochimica Acta, Volume 26, Issue 9, September 1962, Pages 915-920. L. Greenland and J. F. Lovering. 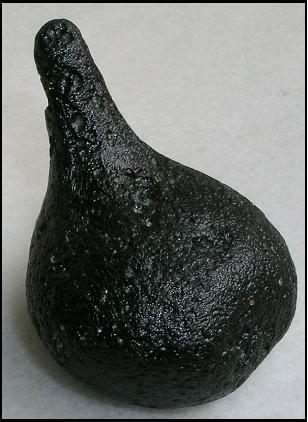 The evolution of tektites: elemental volatilization in tektites. Geochimica et Cosmochimica Acta, Volume 27, Issue 3, March 1963, Pages 249-259. E. C. T. Chao, Edward J. Dwornik and Janet Littler. New data on the nickel-iron spherules from Southeast Asian tektites and their implications. Geochimica et Cosmochimica Acta, Volume 28, Issue 6, June 1964, Pages 971-974. A. N. Thorpe and F. E. Senftle. Submicroscopic spherules and color of tektites. Geochimica et Cosmochimica Acta, Volume 28, Issue 6, June 1964, Pages 981-992. Arch M. Reid, Frederick R. Park and Alvin J. Cohen. Synthetic metallic spherules in a Philippine tektite. Geochimica et Cosmochimica Acta, Volume 28, Issue 6, June 1964, Pages 1009-1010. R. A. Lyttleton. A cometary mechanism for the formation of tektites. Geochimica et Cosmochimica Acta, Volume 28, Issue 6, June 1964, Pages 807-820. Ernst W. Adams and R. Milton Huffaker. Aerodynamic analysis of the tektite problem. Geochimica et Cosmochimica Acta, Volume 28, Issue 6, June 1964, Pages 881-892. Virgil E. Barnes. Rayed bubbles in tektites. Geochimica et Cosmochimica Acta, Volume 28, Issue 9, September 1964, Pages 1373-1374. George Baker. External form and structure of some hollow australites.Geochimica et Cosmochimica Acta, Volume 30, Issue 6, June 1966, Pages 607-612. John A. O'Keefe. Tektite sculpturing. Geochimica et Cosmochimica Acta, Volume 31, Issue 10, October 1967, Pages 1931-1932. E. Jessberger and W. Gentner. Mass spectrometric analysis of gas inclusions in Muong Nong glass and Libyan Desert glass. Earth and Planetary Science Letters, Volume 14, Issue 2, March 1972, Pages 221-225. Billy P. Glass. Crystalline inclusions in a Muong Nong-type indochinite. Earth and Planetary Science Letters, Volume 16, Issue 1, September 1972, Pages 23-26. Darryl S. Futrell. Buried crazed layers in Australasian Muong Nong-type tektites. Journal of Non-Crystalline Solids, Volume 86, Issues 1-2, September 1986, Pages 213-218. Glass, B. P.; Chapman, D. R.; Prasad, M. S. Ablated tektite from the central Indian Ocean. METEORITICS AND PLANETARY, Year: 1996, VOL 31; NUMBER 3, Page(s) 365-369. Dunlap, R. A. An investigation of Fe oxidation states and site distributions in a Tibetan tektite. HYPERFINE INTERACTIONS, Year: 1997, VOL 110; NUMBER ¾, Page(s) 217-226. Haines, P. Tektite-bearing flood deposits in NE Thailand: Palaeomagnetic evidence suggests deposition contemporaneous with 60.8 Ma impact. 17th Australian Geological Convention, Hobart, Tazmania (Australia), 8-13 Feb 2004. (World Meeting Number 000 7220). Haines, PW, Howard, KT, Ali, JR, et al Flood deposits penecontemporaneous with-0.8 Ma tektite fall in NE Thailand: impact-induced environmental effects? EARTH PLANET SC LETT 225 (1-2): pp.19-28 AUG 30 2004. S. R. Taylor. The chemical composition of australites. Geochimica et Cosmochimica Acta, Volume 26, Issue 7, July 1962, Pages 685-722. S. R. Taylor and Maureen Sachs. Geochemical evidence for the origin of australites. Geochimica et Cosmochimica Acta, Volume 28, Issue 2, February 1964, Pages 235-264. Virgil E. Barnes. Variation of petrographic and chemical characteristics of indochinite tektites within their strewn-field. Geochimica et Cosmochimica Acta, Volume 28, Issue 6, June 1964, Pages 893-913. C. C. Schnetzler and W. H. Pinson, Jr. A report on some recent major element analyses of tektites. Geochimica et Cosmochimica Acta, Volume 28, Issue 6, June 1964, Pages 793-806. S. R. Taylor. Geochemical comparison of Australian and North American tektites. Geochimica et Cosmochimica Acta, Volume 29, Issue 2, February 1965, Pages 65-70. Virgil E. Barnes and Richard V. Russell. Devitrification of glass around collapsed babbles in tektites. Geochimica et Cosmochimica Acta, Volume 30, Issue 2, February 1966, Pages 143-144. S. R. Taylor. Australites, Henbury impact glass and subgreywacke: a comparison of the abundances of 51 elements. Geochimica et Cosmochimica Acta, Volume 30, Issue 11, November 1966, Pages 1121-1136. Christian Koeberl. Geochemistry and origin of Muong Nong-type tektites. Geochimica et Cosmochimica Acta, Volume 56, Issue 3, March 1992, Pages 1033-1064. Darryl S. Futrell. Comment on "Geochemistry and origin of Muong Nong-type tektites" by C. Koeber. Geochimica et Cosmochimica Acta, Volume 57, Issue 18, September 1993, Pages 4527-4529. Christian Koeberl. Reply to the Comment by D. S. Futrell on "Geochemistry and origin of Muong Nong-type tektites". Geochimica et Cosmochimica Acta, Volume 57, Issue 18, September 1993, Pages 4531-4532. Kung-suan H.; Ju-chin C. Geochemistry and origin of tektites from the Penglei area, Hainan province, southern China. Journal of Southeast Asian Earth Sciences, January 1996, vol. 13, no. 1, pp. 61-72(12). Humayun, M, Koeberl, C. Potassium isotopic composition of Australasian tektites. METEORIT PLANET SCI 39 (9): 1509-1516 SEP 2004. S. E. Taylor and M. Sachs. Abundance and distribution of alkali elements in Victorian australites. Geochimica et Cosmochimica Acta, Volume 25, Issue 3, November 1961, Pages 223-228. George L. Bate and J. R. Huizenga. Abundances of ruthenium, osmium and uranium in some cosmic and terrestrial sources. Geochimica et Cosmochimica Acta, Volume 27, Issue 4, April 1963, Pages 345-360. R. D. Cherry and John A. S. Adams. Gamma-spectrometric determinations of thorium, uranium and potassium in tektites. Geochimica et Cosmochimica Acta, Volume 27, Issue 11, November 1963, Pages 1089-1096. C. C. Schnetzler and W. H. Pinson, Jr. Variation of strontium isotopes in tektites. Geochimica et Cosmochimica Acta, Volume 28, Issue 6, June 1964, Pages 953-969. J. L. Setser and W. D. Ehmann. Zirconium and hafnium abundances in meteorites, tektites and terrestrial materials. Geochimica et Cosmochimica Acta, Volume 28, Issue 6, June 1964, Pages 769-782. David Tilles. Stable silicon isotope ratios in tektites. Geochimica et Cosmochimica Acta, Volume 28, Issue 6, June 1964, Pages 1015-1017. J. F. Lovering and J. W. Morgan. Rhenium and osmium abundances in tektites. Geochimica et Cosmochimica Acta, Volume 28, Issue 6, June 1964, Pages 761-768. William D. Ehmann. On some tantalum abundances in meteorites and tektites. Geochimica et Cosmochimica Acta, Volume 29, Issue 1, January 1965, Pages 43-48. L. Greenland and J. P. Lovering. The variation of iron and manganese in tektites. Geochimica et Cosmochimica Acta, Volume 29, Issue 5, May 1965, Pages 563-567. D. B. Tatlock. Some alkali and titania analyses of tektites before and after G-1 precision monitoring. Geochimica et Cosmochimica Acta, Volume 30, Issue 1, January 1966, Pages 123-128. W. Gentner, B. Kleinmann and G. A. Wagner. New K-Ar and fission track ages of impact glasses and tektites. Earth and Planetary Science Letters, Volume 2, Issue 2, March 1967, Pages 83-86. W. CompstonDean R. Chapman. Sr isotope patterns within the Southeast Australasian strewn-field.Geochimica et Cosmochimica Acta, Volume 33, Issue 9, September 1969, Pages 1023-1036. W. Gentner, T. Kirsten, D. Storzer and G. A. Wagner. K-Ar and fission track dating of Darwin Crater Glass.Earth and Planetary Science Letters, Volume 20, Issue 2, October 1973, Pages 204-210. S. R. Taylor and S. M. McLennan. Chemical relationships among irghizites, zhamanshinites, Australasian tektites and Henbury impact glasses. Geochimica et Cosmochimica Acta, Volume 43, Issue 9, September 1979, Pages 1551-1553. John A. O'Keefe. Comments on "chemical relationships among irghizites, zhamanshinites, Australasian tektites and Henbury impact glass". Geochimica et Cosmochimica Acta, Volume 44, Issue 12, December 1980, Pages 2151-2152. D. M. Van Patter and C. P. SwannBilly P. Glass. Proton probe analysis of an irghizite and a high-magnesium Java tektite. Geochimica et Cosmochimica Acta, Volume 45, Issue 2, February 1981, Pages 229-234. Joel D. Blum, D. A. Papanastassiou, C. Koeberl and G. J. Wasserburg. Neodymium and strontium isotopic study of Australasian tektites: New constraints on the provenance and age of target materials. Geochimica et Cosmochimica Acta, Volume 56, Issue 1, January 1992, Pages 483-492. Schmidt, G.; Zhou, L.; Wasson, J. T. Iridium anomaly associated with the Australasian tektite-producing impact: Masses of the impactor and of the Australasian tektites. GEOCHIMICA ET COSMOCHIMICA ACTA, Year:1993, VOL 57; NUMBER 19, Page(s): 4851. Murty, S. V. S. Noble Gases in a Muong Nong Tektite. Mass spectrometry 6th National symposium on mass spectrometry 1993; Oct. NATIONAL SYMPOSIUM ON MASS SPECTROMETRY, Year: 1993, VOL 6th, Page(s) 483-485. Gerhard Schmidt, Lei Zhou and John T. Wasson. Iridium anomaly associated with the Australasian tektite-producing impact: Masses of the impactor and of the Australasian tektites. Geochimica et Cosmochimica Acta, Volume 57, Issue 19, October 1993, Pages 4851-4859. Etienne Deloule, Marc Chaussidon, Billy P. Glass and Christian Koeberl. U-Pb isotopic study of relict zircon inclusions recovered from Muong Nong-type tektites. Geochimica et Cosmochimica Acta, Volume 65, Issue 11, 1 June 2001, Pages 1833-1838. Pinti D.L. ; Matsumoto T.; Matsuda J-I. ; Fang Z. Distribution of noble gases in Chinese tektites: Implication for neon solubility in natural glasses. Meteoritics & Planetary Science, 1 January 2004, vol. 39, no. 1, pp. 87-96(10). Glikson, A, Allen, C. Iridium anomalies and fractionated siderophile element patterns in impact ejecta, Brockman Iron Formation, Hamersley Basin, Western Australia: evidence for a major asteroid impact in simatic crustal regions of the early Proterozoic earth. EARTH PLANET SC LETT 220 (3-4): 247-264 APR 15 2004. R. A. Dunlap and A. D. E. Sibley.4) A Mossbauer effect study of Fe-site occupancy in Australasian tektites. Journal of Non-Crystalline Solids, Volume 337, Issue 1, 1 June 2004, Pages 36-41. P. Ma, K. Aggrey, C. Tonzola, C. Schnabel, P. de Nicola, G.F. Herzog, J.T. Wasson, B.P. Glass, L. Brown, F. Tera et al. Beryllium-10 in Australasian tektites: Constraints on the location of the source crater. Geochimica et Cosmochimica Acta, Volume 68, Issue 19, 1 October 2004, Pages 3883-3896. Zhang, F.; Huang, Z.-T.; Mo, J.-Y. Fission-Track Age of Bobai County and Baise Basin Tektite in Guangxi. Chinese Science Bulletin, v 39, n 21, 1994, p 1806. Clark, T. M.; Evans, B. J. Comparative analysis of the petrogenesis and iron oxidation states in tektite glasses: Muong Nong Va. splash-form tektites. CONFERENCE PROCEEDINGS- ITALIAN PHYSICAL SOCIETY, Year: 1996, VOL 50, Page(s) 745-748. Taylor, S. R. The Australasian tektite age paradox. METEORITICS AND PLANETARY SCIENCE, Year 1999,VOL 34; NUMBER 3.Page 311. TECHNICAL COMMENT SUMMARIES: Tektites and the Age Paradox in Mid-Pleistocene China. Science. Violence. 289(5479):507, July 28, 2000. Koeberl, C, Martinez-Ruiz, F. The stratigraphic record of impact events: A short overview . IMPACT STUD : pp. 1-40 2003. * Relevant hits means hits with the word ‘Tektite’ and related to the ‘Australasian strewn field’.